My Blackline LSD came and I was trying to sort out a way to get it fitted. However, most of the people who I would normally outsource this kind of work to are in the UK and I just couldn’t sort out the logistics. With Zandvoort approaching, I decided I’d have to roll up my sleeves and do it myself. There are tonnes of differential rebuilding videos on youtube and I spent a while watching these to get a feel for what I was up against, the video below is not specific to Triumph Spitfires/GT6’s but explains most things pretty well. In terms of spares, I bought a selection of carrier bearing shims and new Timken carrier bearings. While it was all out of the car Jon Wolfe persuaded me to also go with a Bastuck alloy diff housing. Step one was to fit the differential bushes. 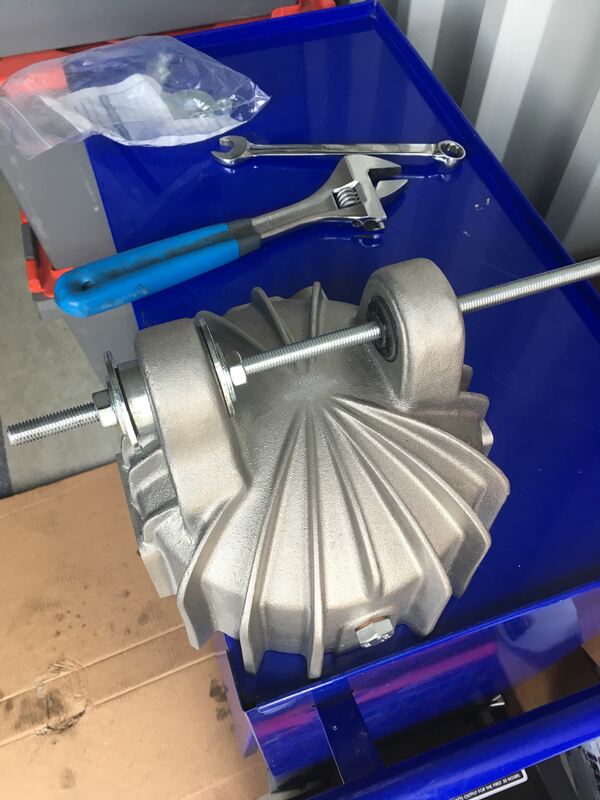 Since having moved to Luxembourg I’m renting a great workshop space but a lot of the heavy stuff in my garage had to be sold or left behind, so I had to fit the bushes without a vice or a press. I used a piece of threaded bar and a couple of big washers to wind them in (see pic below). 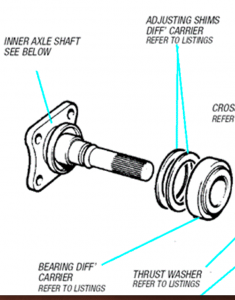 Next up was the part I was most concerned about – the carrier bearings. I’d read and seen all sorts of approaches to this up to and including heating them until they were glowing red and freezing the carrier to make it shrink. This seemed a bit extreme to me and I didn’t want to damage anything. It turned out that a tiny bit of heat was enough to allow me to gently drift them on using a copper mallet and a suitable piece of pipe. So, once all the bits were in place it was time to try refitting it. 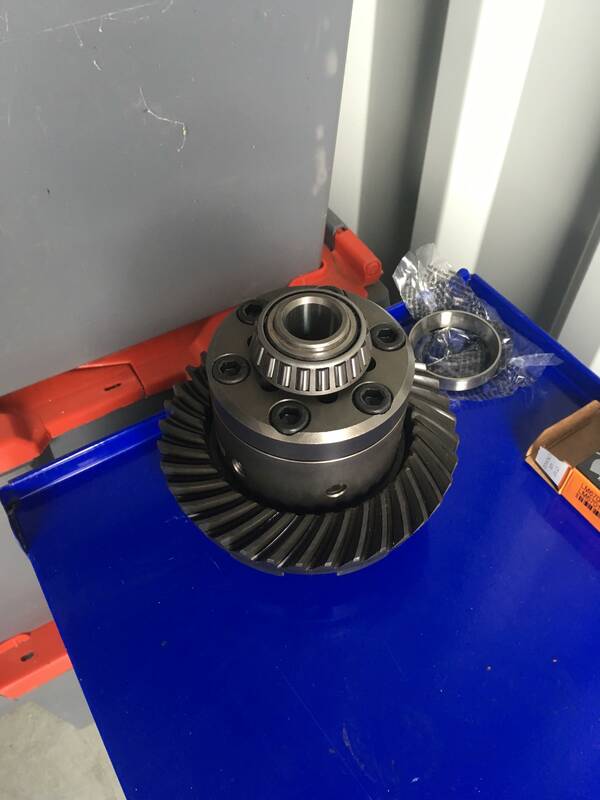 I hadn’t touched the pinion gear, so hopefully all I needed to do was to get the backlash and runout within spec and torque everything up. Now, there are tonnes of articles about setting the backlash on a differential, but not many that explain clearly *why* you’re doing it. Essentially, the backlash is how much the crown wheel moves back and forth, whilst the pinion gear remains fixed (or the other way around, but it’s easier to measure the crown wheel). The closer together they are (as pictured they are touching) the less you’ll be able to move one without moving the other. As they’re currently touching there would be zero backlash, however if the top gear is moved up a bit it’ll be able to wiggle back and forth before the teeth make contact with the teeth of the bottom gear. 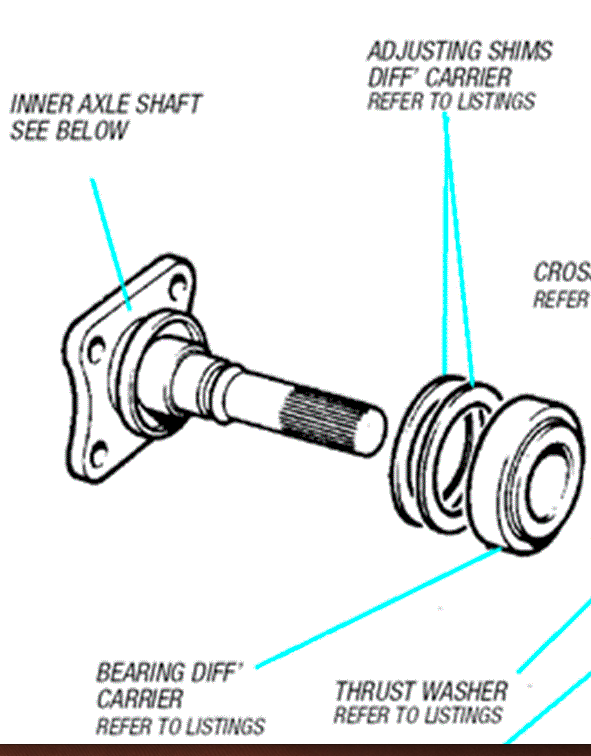 This ‘wiggle’ is the backlash and it is specified in the manual – for a Triumph Spitfire it is 4-6 thousands of an inch. I’m no expert, but I guess it’s done this way as for the crown and pinion to mesh correctly they need to be set at a certain depth, however there’s no realistic other way to measure this depth. 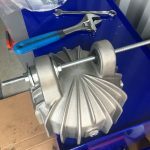 You can’t get a feeler gauge in between or under the gears and good luck measuring the distance between the center point of the crown wheel and the middle of a pinion gear. 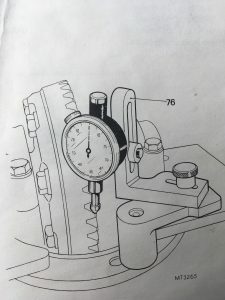 To measure the backlash, I set up a dial gauge with a magnetic base onto the diff casing itself and as close as possible to the angle shown in the diagram below. i.e. at right angles to the crown wheel teeth. Then you can grip the input flange with one hand and moving the crown wheel back and forth with the other hand whilst reading from the dial gauge. The measurements should be taken in a few places to make sure it’s even all the way around and not just on one tooth. 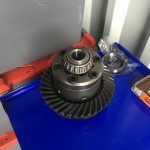 In layman’s terms way to change the backlash is by moving the crown wheel left and right or closer and further away from the pinion, the closer it is the smaller the backlash will be, the further away it is the larger it will be. To move it left and right shims are added or removed from either side between the casing and the carrier bearings. In the workshop owners manual they have the calculation for exactly which thickness of shims correspond to how much backlash change. There are two other considerations. One is the runout (how much the crown wheel moves left/right as it turns) which needs to be < 2 thousandths of an inch (as, perhaps obviously now any more than this will mean it’s impossible to get the backlash within spec). And the other is the bearing preload, which really means how tight the carrier assembly is to turn when you’ve got all your shims in. I had kept the original shim packs for the old carrier and carefully noted which side they were from, so I used that as a starting point (without much expectation that it’d be correct, but it was worth a try…). Fitting the whole assembly with the shims can be a bit tricky, but the video above shows pretty much the approach I took – by the end of the day I’d had quite a bit of practise. The first attempt went great, except there was absolutely no backlash at all – the whole thing was as tight as a clam. So out it all came… Knowing now that to increase the backlash is simply just a matter of moving the crown wheel away from the pinion and decreasing it is the opposite, I had enough shims and patience to spend an afternoon assembling, disassembling and reassembling the whole thing multiple times. Eventually I got it as spot on as I could (roughly 5 thou most of the way around the diff) and no more than 2 thou runout. I then double checked the wipe pattern with gear marking paint, initially I found this quite difficult to read until I realised I was using far too much of it 🙂 The contact pattern I had looked pretty much ok, as pictured below. So all that was left was to double check the torque of everything and reassembly. 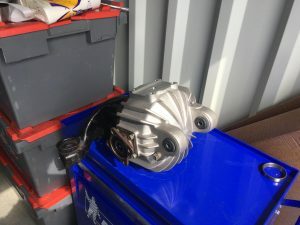 So I don’t forget, the torque specs for the Triumph Spitfire differential crown wheel bolts are 48 lb/ft and the bearing caps 38 lb/ft..
One last note is that the alloy housing is a tight fit to get on, I had to turn the diff on the input shaft to allow it to clear the LSD body. Once it’s on it’s a perfect fit and a reasonably easy reassembly from thereon out.